At a meeting in Mandeville last month, St. Tammany Parish Councilman Jake Groby III discusses how communities could be re-designed to deal with expected flooding. 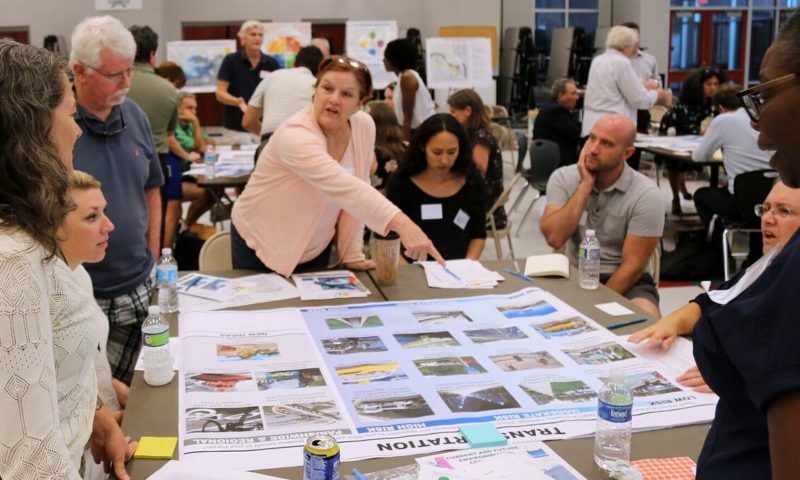 In July, residents of St. Tammany Parish discussed the types of transportation that could be planned for different areas based on their flood risk. It was one of a series of meetings held in six coastal parishes to help the state decide how to deal with coastal erosion and rising water. After meeting with about 4,000 residents over the course of a year, state leaders are working on a report that could reimagine how communities in southeastern Louisiana deal with coastal erosion and sea-level rise. If some of the proposed policies become reality, residents in coastal areas at risk of serious, repeated flooding could become part of a massive effort to encourage them to relocate to higher ground. Prohibit residential construction outside planned levees and floodwalls in some high-risk areas that would experience extreme flooding. Create a buyout program so residents can move out of those high-risk areas. Phase out the homestead exemption for property taxes in high-risk areas outside levees and floodwalls. Require new commercial developments to have bonding that will pay for demolition at the end of their useful life or long-term vacancy. Require certain communities to participate in a program that lowers flood insurance rates if they limit development in flood-prone areas and encourage flood-resistant construction. Some of those ideas are controversial. Besides housing, the proposals deal with transportation, the economy and the state’s fishing and tourism industries. The upcoming report drawing on these ideas could be an important framework for how Louisiana deals with one of the highest rates of sea-level rise in the world, coupled with the loss of 10,000 acres of land every year. But the state still has a long way to go before it sets any policies. Given Louisiana’s continual budget shortfalls, funding is far from certain. Sanders said the state is not pursuing a mandatory resettlement program, even in portions of the coast projected to experience up to 14 feet of flooding during 100-year events. Such storms have a 1 percent chance of occurring in any year, or a 26 percent chance of occurring over the course of a residential 30-year mortgage. In 2010, about 80,000 people lived in areas that in 2067 will be deemed to be “high risk,” meaning a 100-year flood would bring more than six feet of water, according to the Office of Community Development. In December, Bloomberg reported that the state is planning to “empty out its coastal plain.” The state Office of Community Development published a statement saying that’s not true, and Sanders and other state officials said they’re not done with the report yet. But they do have a list of 70-some “recommended policies” that could be part of the report. The proposals point to a strategy of limiting development in the most vulnerable coastal communities and making it more expensive for people who remain. Sanders said those proposals are the product of a “ground up” approach: about 70 meetings with residents and other community members in six coastal parishes. Those parishes — Terrebonne, Lafourche, Jefferson, Plaquemines, St. John the Baptist and St. Tammany — suffered significant damage from Hurricane Isaac in 2012. The meetings were held by Louisiana Strategic Adaptations for Future Environments, or LA SAFE, a community planning process organized by the state Office of Community Development, where Sanders works, and the Foundation for Louisiana. Mark Davis, director of the Tulane Institute on Water Resources Law & Policy, said the proposals show that residents realize they’ll have to make difficult choices if their communities are to adapt to the dual threats of land loss and rising water. The report, due out later this year, will lay out a regional adaptation framework with recommended policies and projects, along with a pilot project and an individualized plan for each parish. The proposals point to a strategy of limiting development in the most vulnerable coastal communities and making it more expensive for people who remain. Right now, the proposals exist as part of a four-page document made public at meetings in the six parishes. The presentation describes the planning process and lists about 70 proposals in five different categories: stormwater management, housing and development, transportation, education, economy and jobs and culture and recreation. Require the state to account for flood risk before designing transportation routes, and retrofit existing ones to deal with flooding. Incorporate ferries into evacuation plans. Improve training in careers related to the coast, and diversify the local economy by giving tax rebates to use renewable energy. Require new housing developments to be built at least two feet above base flood elevation. Offer financial incentives to elevate homes and fortify them against strong winds. Build recreational facilities that mitigate flood risk. Create a state Office of Resilience to oversee these efforts. Sanders said the policy recommendations were compiled by an LA SAFE planning team, based on discussions at those meetings. Some places would see catastrophic flooding. About 2,400 structures could be subjected to flood depths of more than 14 feet and could be bought out by the state. At an LA SAFE meeting in Mandeville last summer, St. Tammany Parish Councilman Jake Groby III discussed how communities could be redesigned to deal with expected flooding. Those predictions come from the latest version of the Louisiana Coastal Master Plan, a blueprint to rebuild the coast and protect some of what’s left. The 50-year, $50 billion Master Plan largely relies on pipelines, massive river diversions, levees and floodwalls. It also calls for roughly $6 billion in “nonstructural” projects: elevating, flood-proofing or buying out homes. The LA SAFE process is designed to be a framework “leading they way” for the nonstructural portion of that plan, said Pat Forbes, executive director of the state Office of Community Development. But the $40 million LA SAFE planning grant is paltry compared to the $6 billion it would cost to elevate, flood-proof and buy out homes and businesses. Ultimately, Forbes said, it will be up to local, state and federal officials to decide if they want to implement the ideas. The draft plan with recommended policies was supposed to be finished in December. Sanders said that didn’t happen. The final report is supposed to be finished by March, but Sanders said that, too, could change. By the end of the process, the six parishes will have their own individual plans and partially funded pilot projects to help their communities adapt. Ultimately, officials hope the report, along with the completion of six community-based projects, will serve as a model for coastal areas elsewhere threatened by climate change. Coastal experts say the proposals signify that some residents and state officials recognize that bold solutions are needed if the state is to prepare for the coastal changes underway. That was evident from Cormier’s reaction. He compared it to Le Grand Dérangement, the forced removal by the British of the Acadian people from Canadian provinces in the 1700s, which resulted in many Cajuns settling in Louisiana. Though these discussions have only recently come into view, researchers and state officials have been working for some time to deal with the crisis facing Louisiana’s coastal communities. In December, the state entered negotiations to purchase a 515-acre sugarcane farm near Thibodaux to resettle the residents of Isle de Jean Charles. The lone road to the quickly-sinking island in south Terrebonne Parish is regularly inundated by floodwaters. A $48 million federal grant will move residents, who are members of the Biloxi-Chitimacha-Choctaw tribe, about 40 miles northwest, an area less vulnerable to flooding. Sanders is leading that effort. In 2014, the Tulane Institute on Water Resources Law and Policy concluded that many residents will eventually have to leave southeast Louisiana, whether they are forced out or given incentives to leave. The 2017 iteration of the Master Plan calls for flood-proofing 1,398 businesses and elevating 22,432 homes. It includes voluntary buyouts for 2,403 properties, but the state doesn’t identify where they are and says it doesn’t have funding to put the plan in action. There may be other roadblocks, too, outlined in the 2014 Tulane report. It said voluntary relocations and government-run resettlement efforts have been the product of “failed government intervention” and have been hamstrung by public distrust. Corey Miller, the community engagement director for the Coalition to Restore Coastal Louisiana, said residents probably will be more receptive to changes that come out of the LA SAFE process because they have had a hand in it. “It’s community-driven action to address the challenges of our land loss and our changing coast,” he said. 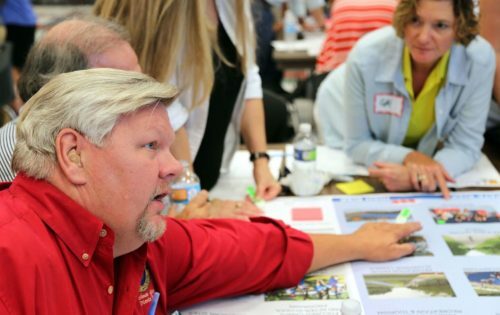 Bren Haase, Chief of the Planning and Research for the Louisiana Coastal Protection and Restoration Authority, agreed that the LA SAFE process is valuable because residents are taking part in the initial stages of the planning process. He said the coastal restoration authority may be interested in incorporating some of the proposals into its Coastal Master Plan. Haase said there were a number of technical issues to work through first, however, before the state could even think about implementing the policies. One of them is identifying which entity would put the ideas into action — and which one would have the money to carry them through.